Stefan Stoian is a 15-year-old boy and lives in Bucharest, Romania. Because of his physical and learning disabilities, access to education was never easy. In 2011 his impairments got worse but the school Stefan was going to refused to make any adjustments to accommodate his disabilities, resulting in him not being able to continue to attend the school. With the support of lawyers, he and his family appealed to Romanian courts but got nowhere, so in 2013 turned to the European Court of Human Rights where he is represented by lawyer Constantin Cojacariu. MDAC intervened in this case by advising the Strasbourg Court on how international law requires inclusive education for all children. Stefan Stoian in his family home in Bucharest, Romania. Source: Family Photo. In September 2015 he was admitted, based on his academic results, to Mihai Eminescu High School in Bucharest. This school refused to make any adjustments and for some time Stefan could only get to the first floor if his mother carried him up the stairs. Classroom equipment was not adapted and the curriculum was not adjusted – two essential elements of inclusion. The school agreed to make physical modifications, and while waiting for these Stefan was home schooled. In February 2016 he went back and found that the school had broken its promise: it was still inaccessible and the teachers were unwilling to ensure his inclusion. The school also refused access to Stefan’s personal assistant, meaning Stefan was denied education. 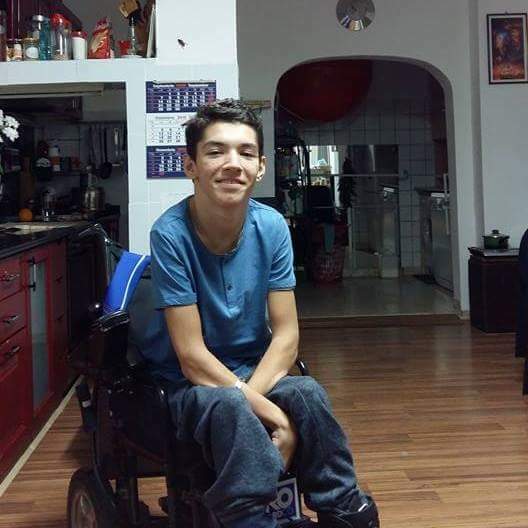 The European Centre for the Rights of Children with Disabilities and MDAC sent a joint letter to the Romanian Government calling on them to take action and ensure Stefan gets an inclusive education. The two NGOs organised a press conference this week in Bucharest. “I want to earn money on my own”, said Stefan at the press conference, “which would help me support the family I hope to have one day”. To “have a future”, Stefan said that is is “very important” that he attends school. Please write to Mr Adrian Curaj, Minister of Education at contact544@gov.edu.ro encouraging him to make sure Stefan Stoian, and the 60,000 other children with disabilities in Romania get an inclusive education. Please copy mdac@mdac.org so we can follow up with responses. The letter we sent requiring action for Stefan’s specific case is available here [in English] and here [in Romanian].